Who is required to sign a Contract? 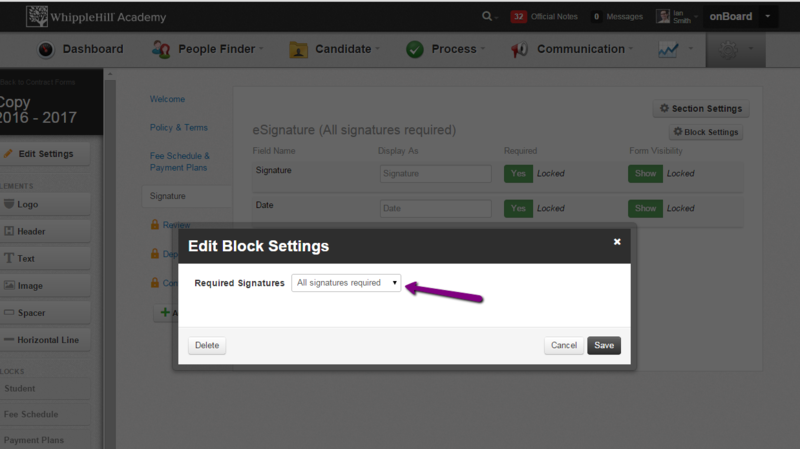 When "All signatures required" is selected, all users listed as Responsible Signer will be required to sign the contract. If a Grandparent is marked in Relationship Settings as Responsible Signer, then they are required to sign the Contract. If "One Signature Required" is selected, then only one user is required to sign the Contract. Students, who are not legally 18 years of age, cannot sign a legal binding contract in place of a Parent or Guardian. *Note: In circumstances when "One Signature Required" is selected for a Contract Form, it is advised that the Parent designated to sign the contract does so in one session. If another Parent or Guardian logs in and reviews the Contract before the form is submitted, there is the possibility of two signatures appearing on the Contract. Coordination between Parents and the school is very important to avoid this type of scenario.